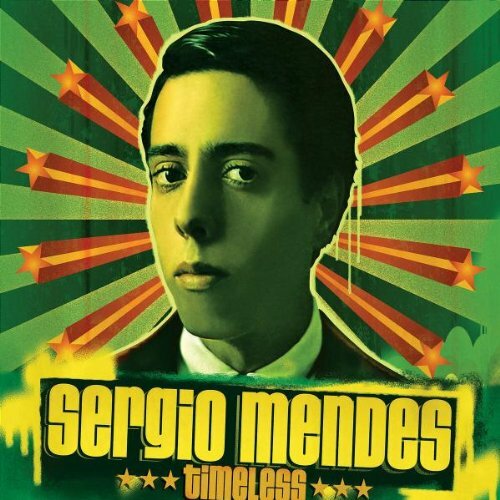 Sergio Mendes, who is the best-selling Brasillian artist of all time, is the creator of Timeless, a collaboration album with will.i.am that features a slew of guests such as Jill Scott, Black Thought, John Legend, Q-Tip, Erykah Badu, Stevie Wonder, Pharoahe Monch and more. The album is lively and entertaining, as it bounces around mixing lush and refined takes on Bossa Nova, Samba, pop and hip-hop. Far from a tepid release, Timeless feels like a true collaboration because of its nature. Mendes’ playing is elegant, with beautiful progressions that at times save entire songs. Match that along with will.i.am’s positive–albeit not entirely persuasive–production input and you get two musicians fusing together their sounds to breed an entire new platform. “Please Baby Don’t,” a track written and sung by John Legend works perfectly because its smooth nature comes out of Legend’s understanding of Brasilian music’s tone and Mendes’ accompanying piano riffs that match his voice. “Berimbau/Consolacao” on the other hand features groovy chorus singing that flows with will.i.am’s selective electronic percussion and Stevie Wonder’s crackling harmonica. The song “Samba da Bencao” is beautiful with Mendes’ twiddling acoustic piano and the backing horns. And “Loose Ends” brings together Justin Timberlake, Pharoahe Monch and will.i.am, creating a great example of hip-hop’s worldly fusion. The basis of Timeless is that hip-hop can adjust and fit into a certain mold regarding worldly music, as well as being deeply rooted in a cultural sound. By mixing in various genres like Bossa Nova and Brasilian pop into a steady flow of hip-hop and r&b, Timeless is a construct between eras: Sergio Mendes and will.i.am; the influence and those influenced; the samples and hip-hop. Because of this, Timeless is essential in understanding the music realm. It’s key in putting focus on music eras and sounds, and also showcasing what happens a collaboration between eras successfully works out. By all accounts Sergio Mendes is a legend. Hailing from Brasil, Mendes has headlined over 50 records combining Samba and Bossa Nova with elements of funk, rock and jazz, creating a unique hybrid of classic Brasilian rhythms and American syncopation. There is no doubt that he is right up there with some of the other musical legends of Brasil such as Jorge Ben Jor, Joao Gilberto, Caetano Veloso and Antonio Carlos Jobim. So if Sergio Mendes is known for mixing and matching Brasilian grooves with other types of music, what would happen if he collaborated with a literal who’s who of the most accomplished hip-hop/R&B artists in the business? Released in 2006, Timeless is a tasty, cross-cultural blend of hip-hop and samba. Produced entirely by Will.I.am, Timeless features the Black Eyed Peas, Justin Timberlake, India.Arie, Stevie Wonder, John Legend, Q-Tip, Erykah Badu, Black Thought, Brasilin rapper Marcelo D2 and more. From the first notes of the reimagined standard, “Mas Que Nada,” you know it’s about to go down. Each track, whether its “That Heat,” “Please Baby Don’t,” “Fo’-Hop (Por Tras De Bras De Pina)” or “Berimbau/ Consolacao” utilizes the smoothness of Bossa Nova, the percussive strut of Samba as well as the technological patterns and loops of hip-hop. Timeless finds the Black Eyed Peas, especially Will.I.Am, doing something different and it comes as a breath of fresh air. Ultimately this album does not come with a heavy dose of socio-political commentary. However, this is not needed on this album. Instead, Timeless is a celebration of life, the legacy of Brasilian music and hip-hop culture. At one point it feels and sounds as if you are cruising through the streets of Rio, taking in the sights, sounds, smells and heat of the vast city, beaches and oceans. One track later, it feels more as if you’re cooking out, blaring music and dancing during a summer block party up in the United States. Based on the fact that Sergio Mendes and many of the most successful hip-hop/R&B artists in the United States were involved in this project, you really can’t go wrong. Take the time to listen and you will see why Timeless couldn’t be a better name for this record.